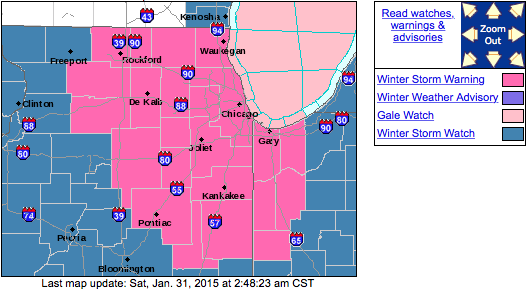 UPDATE: The Winter Storm Warning continues for the entire Stateline area through midnight Sunday night. The snow will continue to fall through Sunday evening. Snow totals look to be at least 6 inches area wide but larger amounts are becoming more likely. Generally 6" near the Wisconsin border. Closer to Rockford totals look to be greater, near 8 inches. South is where you will find the highest totals, 10 inches or more closer to Chicago. Main impacts will be to travel. Snow covered roads will be a concern tonight and tomorrow as the snow continues to fall. Tonight the snow will be slushy in nature, while tomorrow the snow will be lighter. But with gusty winds from the north east and the fluffy snow in place, blowing snow will be a big concern tomorrow and tomorrow afternoon. Blowing and drifting snow could great reduce visibilities and make driving dangerous. 3PM UPDATE: The Winter Weather Advisory for southern Wisconsin has now been replaced with a Winter Storm Warning beginning Saturday night, which now puts the entire Stateline area under the Winter Storm Warning. The timing of the winter storm still looks to be on track for this evening. Rain is currently south of I-88 but will switch over to all snow by 6pm. Good Morning! Everyone ready for the biggest snow to come this winter?? A Winter Storm Warning is in effect for all of northern Illinois and a Winter Weather Advisory for southern Wisconsin all beginning Saturday night and lasting through Sunday evening. If you still have some shopping or errands to do, I would suggest getting everything done now so once the snow does begin, you're not out driving around Sunday. Snow totals still look on track with most areas in northern Illinois likely receiving over six inches of snow, isolated amounts near eight or even nine inches could be very common. Temperatures now are in the upper 20's and will rise into the low 30's during the afternoon. A rain/sleet mix may occur south of Rockford, south of I-88, with the onset of precipitation this afternoon before switching over to all snow after sunset. Timing: Dry and partly sunny through mid-afternoon Saturday. 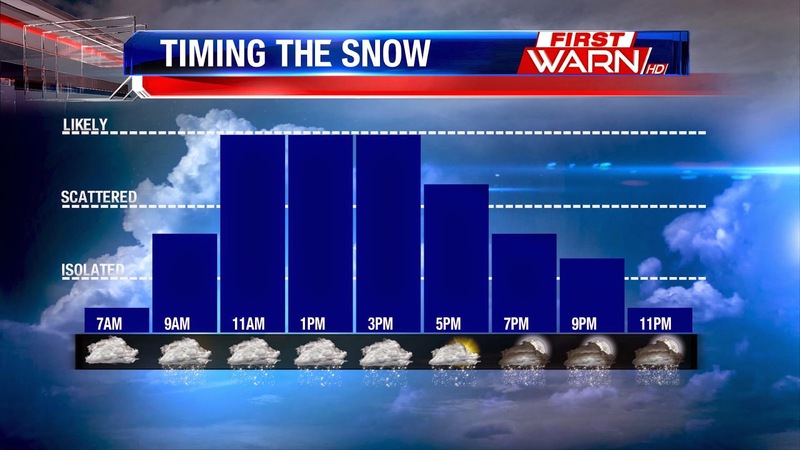 A mix develops south of Rockford as early as 3pm and then switches over to all snow by 6pm. Moderate snow continues through the night Saturday into Sunday. Winds: Northeast winds will increase Sunday morning dropping visibility down to under a mile at times and making it difficult to travel. The snow will lighten up, but the wind stays strong causing the snow to drift and blow through the evening Sunday. Amounts: Snow totals over 6 inches will be very common through the area, with locally higher amounts. Still appears the highest totals will be south of the area with lake effect snow pushing some totals in northeast Illinois and out towards Chicago close to 10 inches to maybe even 12 inches! The snow at onset will be heavier with snow to liquid ratios likely closer to the average of 10 to 12:1. By Sunday morning, the snow should turn a little more light with temperatures in the 20's. Area wide between 6" to 10" of snow is possible. Good news, it's coming down over a 12 hour period, so that should help some. A cold front will slide through northern Illinois later today and it's this front combined with warm, moist air moving in from the south that will bring rapid upward air movement through the atmosphere. While the forcing in the atmosphere isn't overly strong, the quick rise in air is what is going to be responsible for the heavier snowfall tonight and Sunday morning. It still appears likely that the cold front will settle very close to the I-88 corridor. Wherever that front lies is where the heavier snow will fall. By Sunday late morning and afternoon, colder air from the north will push the front further south with low pressure moving through central Illinois. Winds will increase during the morning Sunday sustained around 20-25 mph and gusting 30-35mph. The heaviest snow bands will shift slightly further south, however, light to even moderate snow will continue to fall during the day Sunday. Overnight Saturday, there may already be 3" to 4" of snow on the ground with an additional 3" to 4" coming during the day Sunday. The snow will lighten up Sunday evening, but will continue to fall into the night with little accumulation occurring overnight Sunday. 3:00am Update: A Winter Storm Warning is in effect for Winnebago, Boone, McHenry, Ogle, Lee, and DeKalb counties from 9:00pm Saturday until 9:00pm Sunday. 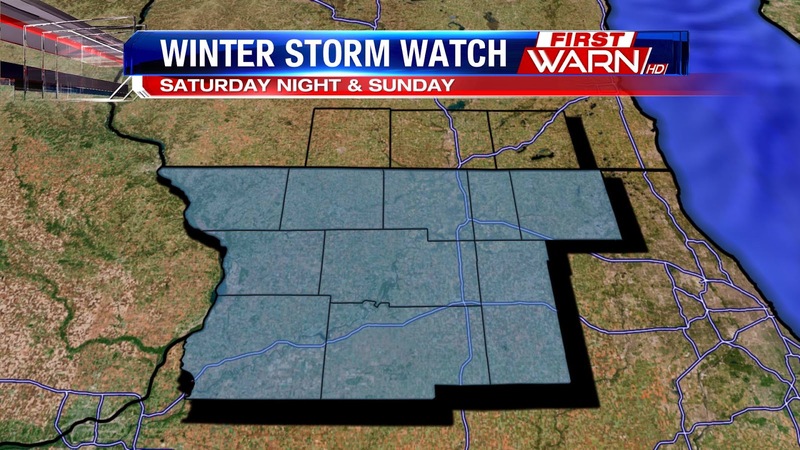 9:00pm Update: Our Winter Storm Watch has been expanded to include Jo Daviess and Stephenson for Saturday night and Sunday. 7:00pm Update: While snow totals could be significant (6"+ in some spots) this weekend, we are more concerned with the snow and wind combining to create dangerous driving conditions, especially on Sunday. Click on the YouTube video below for an update on this weekend's next storm. 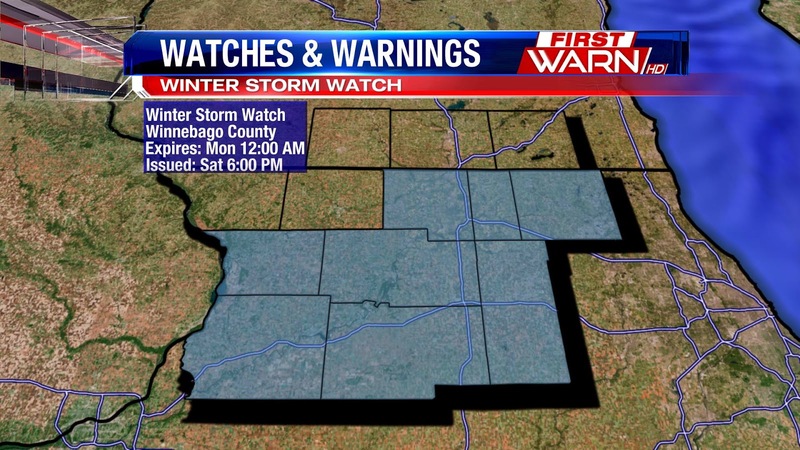 10:30am Update: A Winter Storm Watch has been issued for Winnebago, Boone, McHerny, Ogle, Lee, DeKalb, Carroll and Whiteside counties beginning Saturday evening and lasting through Sunday evening. Snow moves in for the weekend and for some in Illinois, the totals will add up. As it looks right now, Friday morning, the heaviest axis of snow will fall from north-central Illinois southward through I-80. Areas from Sterling, Dixon, Amboy, Paw Paw, Steward and Shabbona could receive in excess of six inches of snow. 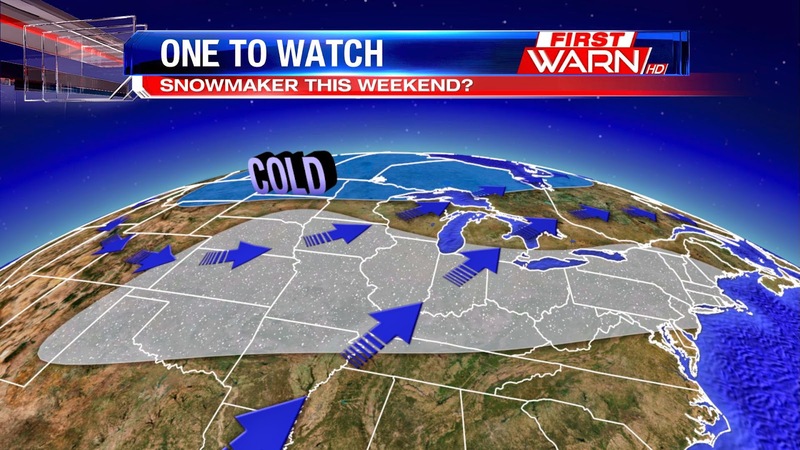 Two main systems will work together this weekend to bring snow through Sunday night. One low is off the coast of British Columbia, with the second in the southwestern United States. While there are still some uncertainties with the exact track of the snow, the timing is pretty much set. Timing: Saturday morning through early afternoon will stay dry with temperatures in the low to mid 30's. A light mix may develop south of Rockford with the leading edge of the precipitation during the late afternoon, but then quickly switch over to snow during the evening and overnight. Look for the snow to begin around 6pm Saturday and become heaviest from around 10pm Saturday through 9am/10am Sunday. Snow will continue to fall during the afternoon Sunday before winding down by Sunday evening. In all, some snow amounts could exceed six inches across northern Illinois. Travel will become heavily impacted once the snow begins Saturday night and continue through mid-day Sunday. This means Sunday morning will experience snow covered roads, wind, and very poor travel conditions. The snow will begin with a little more weight Saturday evening with temperatures in the low 30's, but then turn lighter as the temperature falls through the 20's Sunday. 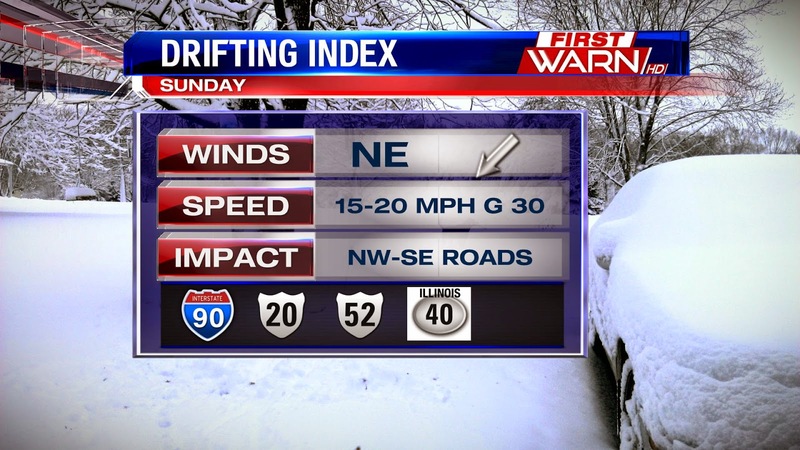 Winds will increase from the northeast Sunday causing blowing and drifting snow. Amounts: Again, snow totals adding up to over 6 inches are possible, with locally higher amounts found to the south of Rockford. A swath of 3" to 6" of snow is possible from the state line south through I-88, and in excess of 6 inches from I-88 southward. From the model runs last night through this morning, the storm track has shifted slightly further north which has bumped up some of the higher totals further north. This does look to be a high impact event with the snow causing travel issues Sunday. If you have any last minute plans or errands you need to finish this weekend, I would suggest getting them done Saturday morning so when the snow does begin, you won't need to travel. If you're heading out for the Super Bowl, consider your route and the amount of time needed to get there. The earlier you travel, the more hazardous the weather will likely be. We'll continue with updates through the evening and weekend so continue to check back. While this isn't going to be the Groundhog Day blizzard of 2011, it will be impactful for travel. Quick burst of snow will fall from southeast Wisconsin and northeast Illinois. It will last through 10am and lower visibility to a mile or less. Accumulations are not expected, but a quick dusting is possible. Winds will continue to gust from the northwest around 30 mph. Sometimes the weather computer just has a mind of it's own and when that happen, you need to think fast. Now I've never been to Arizona, but I would think with temperatures like those, there wouldn't be much of it left. FOX 10's Cory McCloskey handle the 'extreme heat' very well! 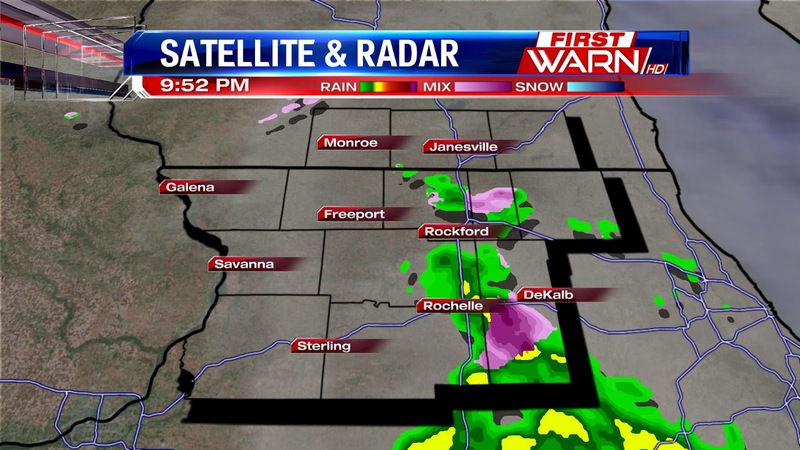 9:50pm Update: Precision Doppler is picking up some potentially icy weather around the Rockford metro. With temperatures at the freezing mark right now, slick spots will be possible. Be careful if you're driving tonight! Original Post: If Monday's icy weather wasn't enough, we could see more freezing rain in the Stateline Wednesday night. As of 9:00pm many areas of the Stateline were still hovering around the freezing mark. The good news temperatures are expected to warm a few degrees after midnight, which would greatly decrease the chance for any icy weather. As for the when and where, our best freezing rain chances will be before midnight in areas along the state line and into southern Wisconsin. Not much more than a glaze is expected, but it would be enough to cause slick spots on roadways. This winter has been a lot of things, but snowy just isn't one of them. Officially since December 1st, we've received 8.2 inches of snow, 11.8 inches for the entire season. Now, we've still got another month and a half of winter to go which will likely put us over the ten inch mark, but with the lack of snow so far I decided to look back at the when some of the least snowiest winters occurred. Could you imagine a winter with only 1.3 inches of snow? That's what happened all the way back during the winter of 1906/1907. The winter of 1927/1928 was next with a whopping four inches, followed by 1920-1921 when 4.7 inches fell. How many of you remember the winter of 2002/2003 when we only received eight inches of snow. If we were done with the cold and snow, this winter would end up within the top ten but we've still got through the end of February and even some of March to go. And between now and then we will get more snow. It wasn't that long ago when the record for most snow occurred. Just a little over 65 inches of snow fell during the winter of 2007/2008. 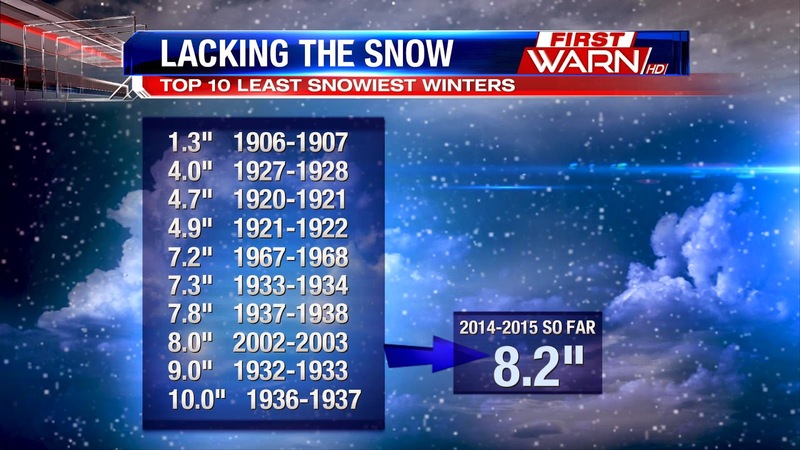 Last year was the 9th snowiest winter on record. If the lack of snow has bummed you out a little, don't worry, we may get a little more for the weekend. Low pressure is forecast to develop in the southern Plains late this week tapping into moisture from the Gulf as well as cold air from Canada. But just where that low tracks and whether the northern or southern branch of the jet stream, or both, will win out is the million dollar question. We've seen this play out before this winter. Several days leading to an event a storm system looks very promising for snow in the Midwest, but then ends up tracking a bit further south sparing us the brunt of the snow. It's possible that this will happen again, especially if the southern branch of the jet streams remains dominant. Our confidence in just where the low tracks and how much snow we'll receive this weekend will go up over the next couple of days and by Friday we should be able to let you know if you'll need to gas up the 'ole snow blower or leave it parked in the garage. The big weather headline this week has been a giant snowstorm that has been producing blizzard conditions for the New England area since Monday. As of Tuesday night, Blizzard Warnings and Winter Storm Warnings continue for parts of six different states. The biggest problem many areas are dealing with is the snow. To put things in perspective, Rockford has seen almost a foot of snow for the entire season, dating back to late October. The highest snow total reported as of Tuesday night triples that. 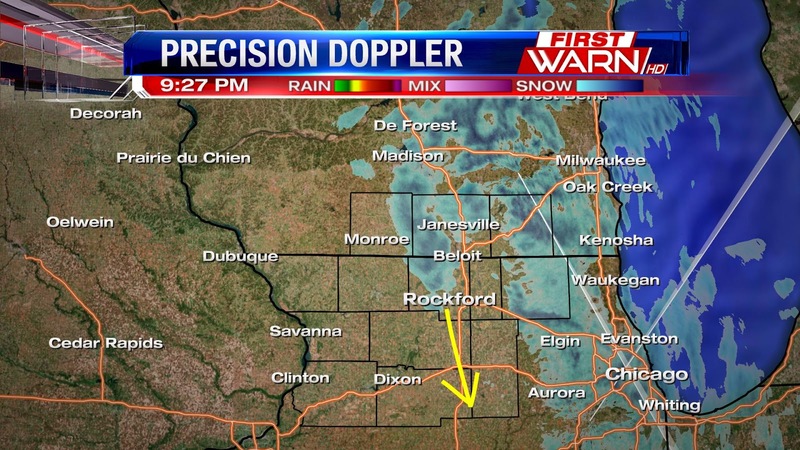 9:30pm Update: A tiny burst of snow is moving back into the Rockford metro. Expect freezing drizzle and snow to wrap up after midnight. Slick roads could stick around for a few more hours after that. A lingering slick spot could be possible Tuesday morning for the early commute, but overall, driving conditions will be much better. 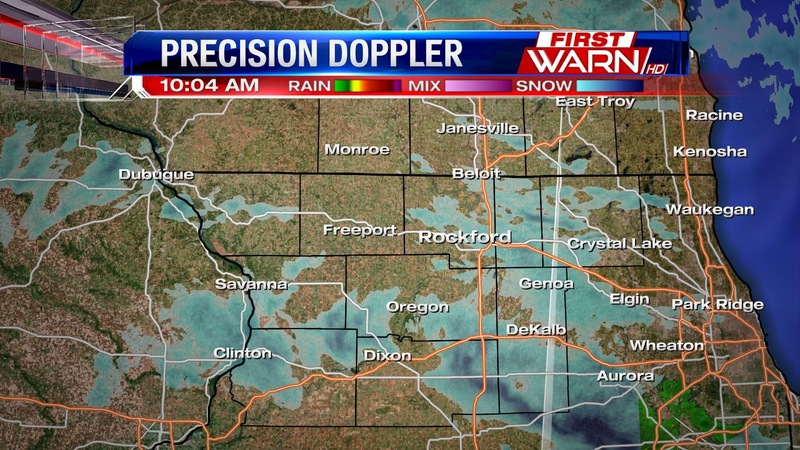 Original Post: Freezing drizzle is making for some very slick roads around the Stateline. If you have to do any driving Monday night, take it slow and be especially careful. The National Weather Service has issued a Freezing Rain Advisory through 6:00am Tuesday for most of northern Illinois, but everyone in the Stateline will see the threat for icy roadways during that time. A few slick spots will still be possible for the Tuesday morning commute, but overall, conditions should be much better. We have already received multiple reports of cars going off the road on US-64 near DeKalb and minor fender benders across the entire viewing area. Aquin vs. Pearl City Girls Basketball has been canceled for Monday night. If we get any other closings, we'll update you here. 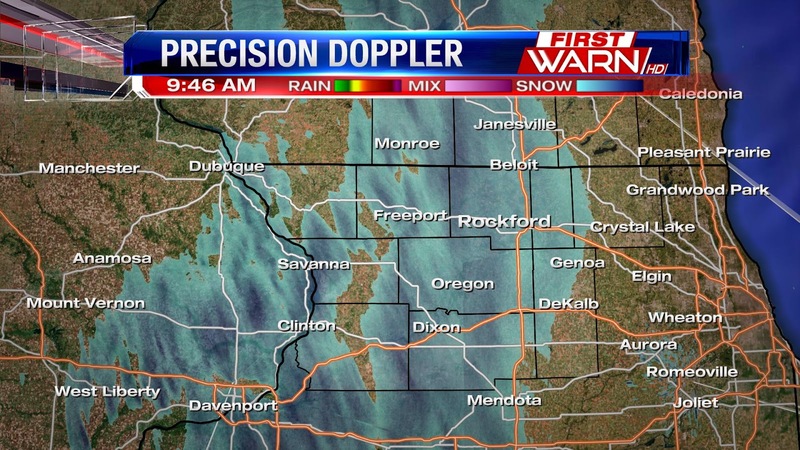 The heaviest of the snow is now moving east of I-39 as visibility gradually improves to the west. Slick roads are reported, however, across NW Illinois so be careful while driving this afternoon. Snow will continue to end from west to east through the afternoon with flurries likely lingering into the evening. 9:50am Update: The snow has moved into Illinois and Wisconsin with heavier snow hugging the Mississippi River. 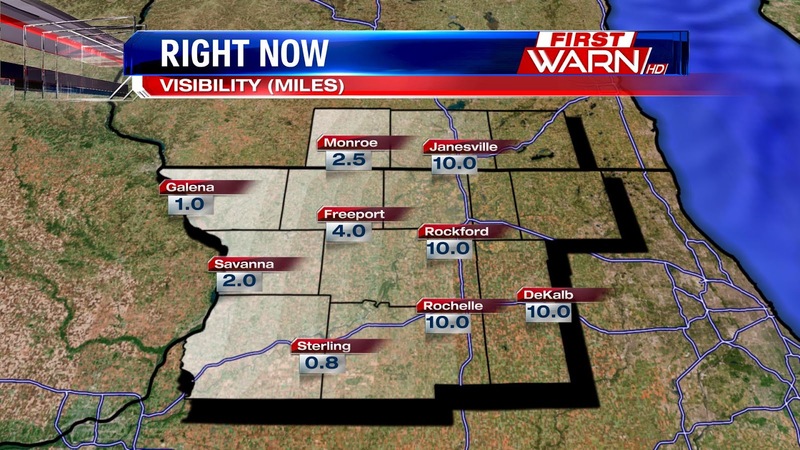 Visibility has dropped where the snow is falling, and for a time was down to under a mile west of Freeport and Lanark. 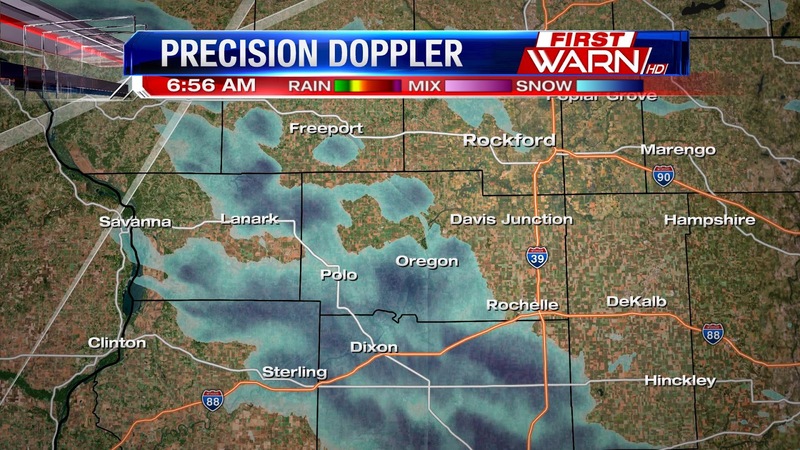 A coating of snow will found on sidewalks, parking lots and roads across NW IL. 7:30am Update: Sunday's snowfall didn't amount to much, anywhere between a few tenths of an inch up to two inches towards the Quad Cities fell, and today's snow will be similar. Light snow will move into Northwest Illinois between 8am and 9am and spread east through 10am. The snow will be light, however there will be a time late morning and early afternoon where a few heavier bursts will be possible. 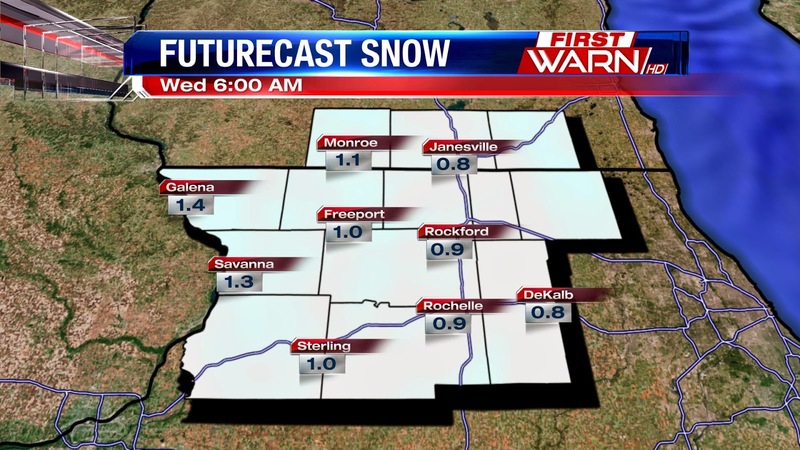 Snowfall amounts will range from a few tenths of an inch east of Rockford, closer to one inch to the west. The snow will continue into the afternoon and evening before turning to flurries after 10pm. The morning commute shouldn't have any issues, but heading out for lunch you'll encounter some snow on the roads as well as for the late afternoon commute. Loran (Jo Daviess) - 1.2"
Nora (Jo Daviess) - 1.0"
9:45pm UPDATE: Newest models now have our next low pushing farther south, meaning less snow for the Stateline. Now going up to 2" along I-88. Lesser amounts as you go north. Blowing snow will still be a concern for Sunday afternoon and evening. Original Post: We haven't seen much snow this winter, but our next chance for the white stuff is coming Saturday night and continuing into Sunday. A low pressure system will swing to our south from the Dakotas late Saturday night. As of Saturday evening, most of this system is in the form of rain. That will switch over to snow as this low encounters colder Stateline air. We are not expecting this to be a big event, with the bulk of the snow falling between midnight and noon on Sunday. Most of the Stateline is looking at 1-2" of snow by Sunday afternoon. Some areas, especially along the I-88 corridor, could see up to 3" of accumulation. The potentially bigger problem comes Sunday afternoon when winds start gusting out of the northeast at about 30mph. This could cause some blowing and drifting on the roads, especially roads with a northwest to southeast orientation. This includes I-90 between Rockford and Chicago and US 20. Almost a foot of snow in Texas! Snow in the south and southwest isn't unusual, but nearly a foot of snow in one day? That doesn't happen too often. But, that was the case down in Texas where parts of the state received almost a foot of snow by Thursday afternoon. Temperatures dropped to freezing during the day Wednesday, changing rain over to snow with cities in New Mexico, Oklahoma and Texas receiving almost 10 inches of snow! A heavy band of snow developed right along the I-40 corridor late Wednesday and produced nearly a foot of snow between the New Mexico and Oklahoma state lines. Snowfall rates of almost 4 inches per hour were reported. That's a lot of snow! With that heavy snow, Amarillo, TX recorded 11 inches, setting a daily snowfall record. Now, compare that to the snow Rockford has received all season. Since the first snow fell back in October (on Halloween), we've only received 11.1 inches. 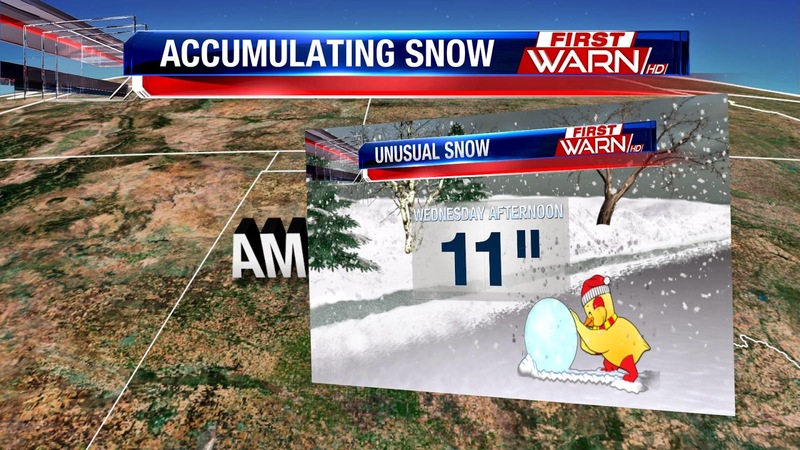 So, this means Amarillo picked up almost as much snow in one day as we've received all winter. Some snow is in the forecast for the end of the weekend, but it won't be enough to make up for our deficit. Cloud cover can be very pesky this time of year, and while there are some obvious negatives to cloudy skies, those same conditions can also work to our advantage. If you hate the cold of winter, cloudy skies at night are a great thing. Cloud cover at night acts much like a blanket. It keeps any warmth at the ground from escaping up into the atmosphere, which makes for relatively warmer lows at night. On the flip side, cloudy skies during the day blocks out the sun. Less sun means relatively cooler highs for the afternoon. 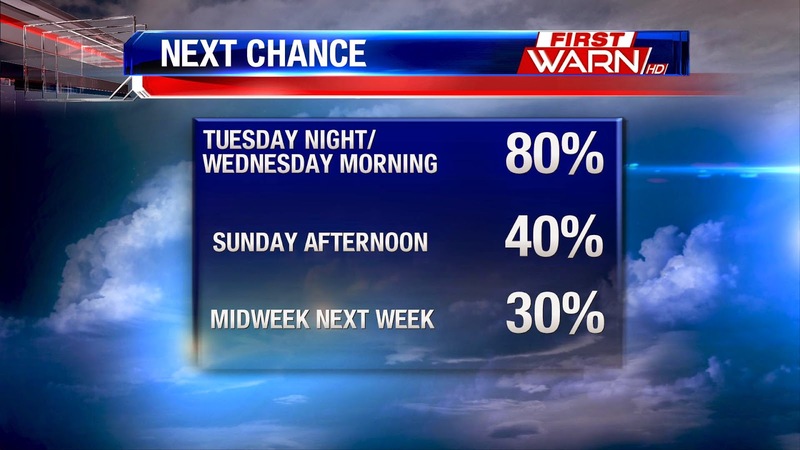 The Stateline experience both of these scenarios on Thursday. Morning lows stayed in the upper 20s to around 30° thanks to heavy cloud cover. Unfortunately, cloudy skies stuck around all day, meaning temperatures only warmed a handful of degrees. 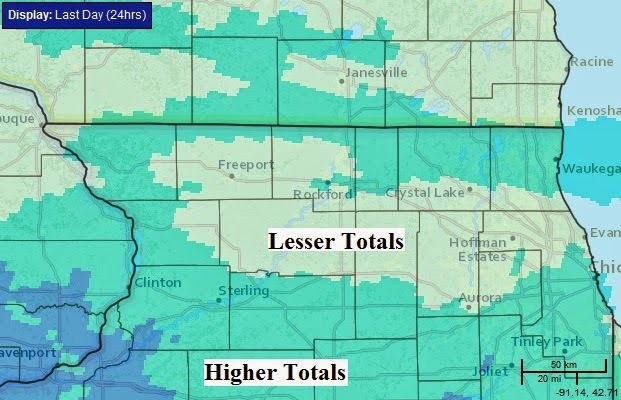 The forecast called for half an inch, up to an inch of snow Wednesday morning, but for residents in Carroll, Whiteside, Jo Daviess, southern Ogle and Lee counties the snow added up to quite a bit more. In fact, anywhere between 4" to 6" of snow came down quickly during the morning commute. Compare that to the 0.3" that was recorded at the Chicago Rockford International Airport. So, what happened? A very narrow band of snow developed to the north of low pressure Wednesday morning. While the low itself was fairly weak, it had enough upper level support and lift in the atmosphere to give the snow a more convective characteristic- meaning more instability...more lift and therefore heavy snow. Visibility was low and the snowfall rates were high allowing the totals to get as high as they did. 10:00am Update: The snow continues to wind down across northern Illinois, but heavier snow has been falling from Steward to Paw Paw in Lee County all morning. That, too, will come to an end early afternoon, but the roads will remain snow covered and slick into the evening. The snow continues to fall, but will weaken in coverage through mid-morning. But, not before dropping nearly 3" of snow in Jo Daviess County from Scales Mound, Elizabeth and Galena. Untreated roads will be slick and snow covered, so allow extra time on the morning commute. Flurries will continue into the afternoon under cloudy skies. The snow will end by tonight, but some area roads may remain slick as temperatures fall below freezing. (9:35:57 AM) nwsbot: Local Storm Report by NWS DVN: 2 SSE Schapville [Jo Daviess Co, IL] trained spotter reports SNOW of M2.0 INCH at 08:15 AM CST -- 5 hour snowfall. alternate location reference is 4 mi nne of elizabeth il. (9:35:57 AM) nwsbot: Local Storm Report by NWS DVN: Mount Carroll [Carroll Co, IL] co-op observer reports SNOW of M0.7 INCH at 08:00 AM CST -- 24 hour snowfall. 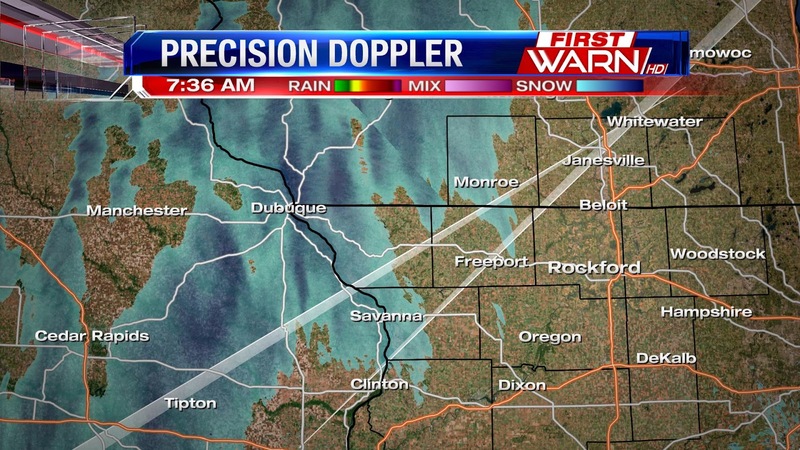 (8:40:27 AM) nwsbot: Local Storm Report by NWS DVN: 1 ESE Nora [Jo Daviess Co, IL] trained spotter reports SNOW of M1.0 INCH at 08:30 AM CST -- total so far. (8:39:14 AM) nwsbot: Local Storm Report by NWS DVN: Freeport [Stephenson Co, IL] co-op observer reports SNOW of M0.2 INCH at 07:00 AM CST -- 24 hour snowfall. (8:15:40 AM) nwsbot: Local Storm Report by NWS DVN: 3 NNE Stockton [Jo Daviess Co, IL] co-op observer reports SNOW of M1.5 INCH at 08:15 AM CST -- snowfall so far. (7:07:25 AM) nwsbot: Local Storm Report by NWS MKX: 2 N Janesville [Rock Co, WI] public reports SNOW of M0.8 INCH at 07:04 AM CST -- relayed via facebook. (6:31:16 AM) nwsbot: Local Storm Report by NWS DVN: ESE Elizabeth [Jo Daviess Co, IL] trained spotter reports SNOW of M3.5 INCH at 06:30 AM CST -- snowfall total. (6:43:11 AM) nwsbot: Local Storm Report by NWS DVN: Elizabeth [Jo Daviess Co, IL] co-op observer reports SNOW of M3.2 INCH at 06:30 AM CST -- 24 hour snowfall. Light drizzle and rain Monday night has caused a few headaches Tuesday morning as surface temperatures have fallen at, or below, freezing. Add to it very light freezing drizzle earlier this morning and it was enough to bring out some of the salt trucks during the morning commute. The threat for any freezing drizzle is done, but now the fog has settled in. 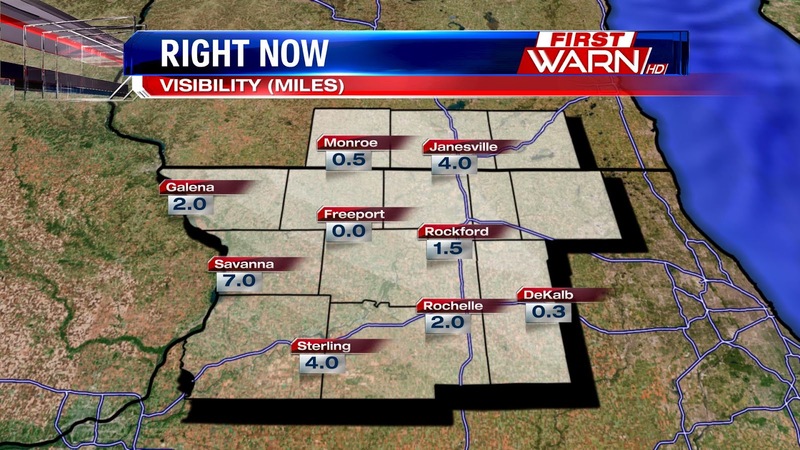 Visibility has dropped near zero in many locations in southern Wisconsin and northern Illinois. While the fog will gradually begin to improve through the morning and afternoon, the clouds will stick around due to a trough of low pressure. What's that you ask? Think of it as an elongated area of low pressure. Weak wind convergence, light surface winds and moisture are all commonly found along a trough of low pressure and with very little movement of air today (due to the light winds), the fog will be hard to completely get rid of. Until low pressure passes, and this doesn't look like it will happen until late Wednesday, anticipate the fog to stick around for the next day. Tonight and Wednesday it shouldn't be as dense as it was Tuesday morning, but the morning commute will be slow as it with light snow falling. 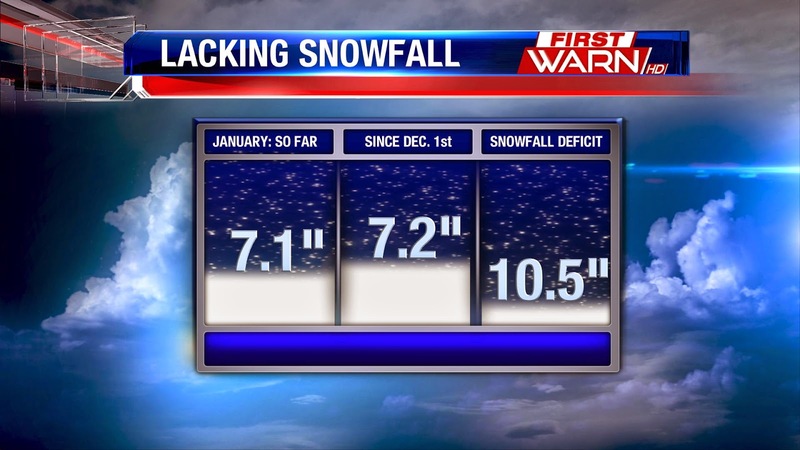 After coming off of the 5th least snowiest December on record in Rockford, we are in need of snow. And so far for the month of January, it's added up to a little more than 7", but we could still use more. Looking at the winter season as a whole since December 1st, we're running far behind. Since December 1st, we've received only 7.2" of snow. This puts us 10.5" below our winter average! A far cry from where we were this time last year. Light snow will move in tonight behind a wintry mix of rain, freezing rain and snow later this afternoon and evening. Accumulations won't be much, up to an inch in some spots, and the snow will be more wet than dry with temperatures right around 30° tonight and Wednesday. 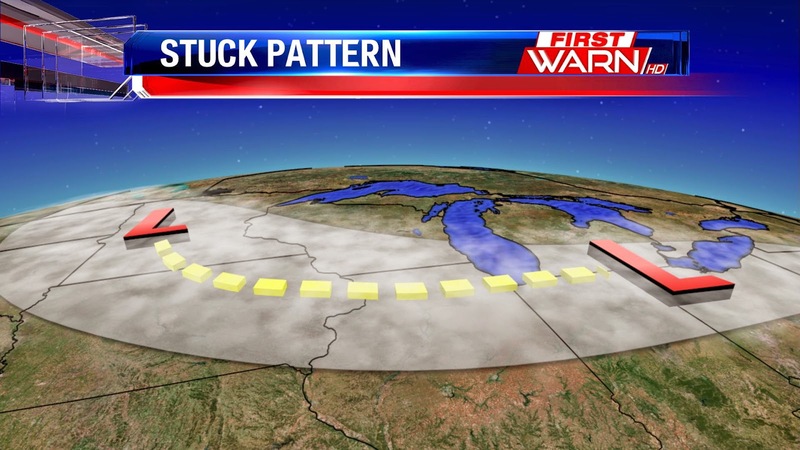 After that, the next chance for snow arrives Sunday, but could bypass us to the west in Iowa. 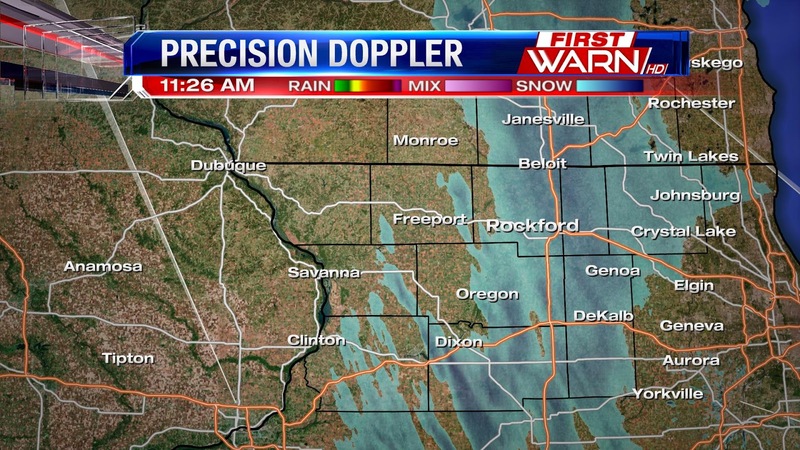 Clipper System Bringing Multiple Snow Chances to the Stateline. 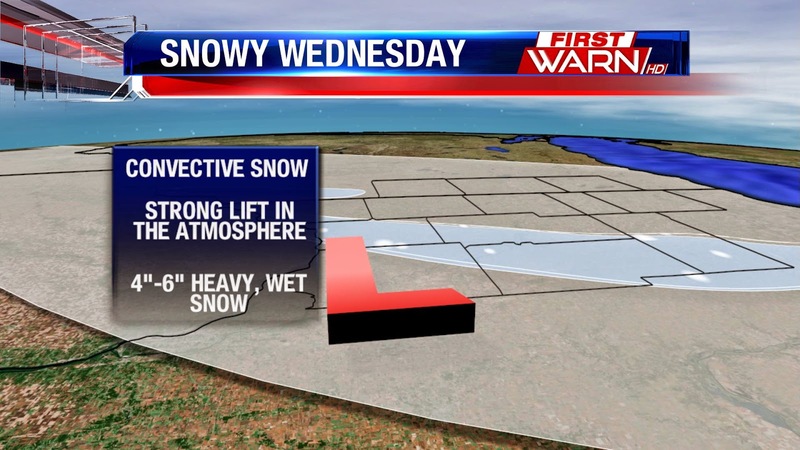 A clipper system approaching the Stateline will bring multiple chances for snow through Wednesday evening. 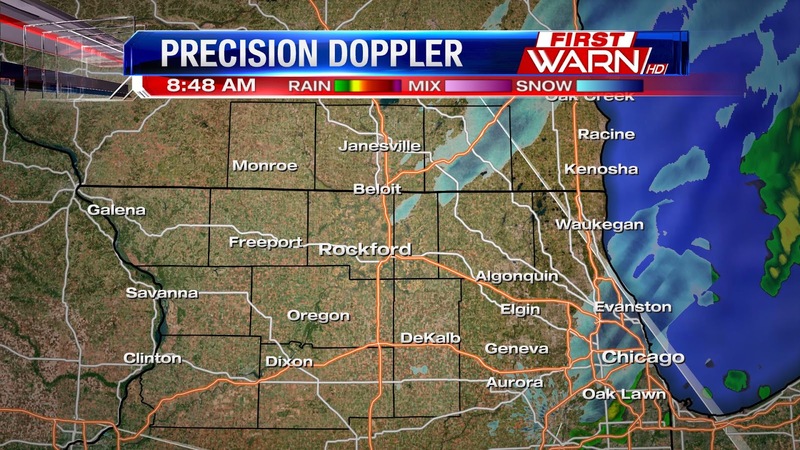 Ahead of the system a light rain/snow mix is already firing up along the Stateline. Temperatures falling near and below freezing and with a strong short wave passing through overnight, we will hold onto the chance for the light rain and then the chance for freezing rain and flurries overnight. It will be light and scattered but still use caution while driving tonight. As the low pressure sinks through the Stateline Tuesday morning along with another wave of energy there will be a continued chance for a light snow mix in the morning. But the better chance for the snow will be later in the day on Tuesday and especially in the evening through Wednesday morning. We aren't talking about a lot of accumulations, but an inch to an inch and a half is expected through Wednesday night. The snow will taper off to flurries by later Wednesday. High pressure builds into the plains Thursday behind a cold front that shifts winds to the northeast allowing for the drying to occur. We end Friday dry with temperatures in the mid 30s. It's official, 2014 has been named the warmest year on record, with records beginning in 1880 based on a study done by NASA and the National Oceanic and Atmospheric Association (NOAA). The global temperature in 2014 was 1.24°F higher than the 20th century average. The global temperature is the average between ocean and land temperatures. Average global land temperatures were 1.80°F above the 20th century average, making it the 4th warmest on record. Average global sea temperatures were 1.03°F above the 20th century average making it the record warmest since 1880. While 1° doesn't sound like a big difference, it is in terms of a global average. When you think about how big the planet is, it takes a lot of energy to move the global average up or down, it also takes more energy to change the temperature of the ocean compared to land. The global average has been trending upwards since 1880, despite year-to-year fluctuations. Large scale weather patterns and events like El Nino and La Nina will have an effect on that year's average. While El Nino is a pattern that warms the tropics, 2014 was actually an El Nino neutral year. You also might remember how cold last year was for us in the Midwest, it was also unusually cool for the East Coast; but places like the West Coast and Alaska experienced their warmest years on record. That is because regional differences are affected by weather dynamics and not so much the global mean. So while it was a frigid winter for us and a fairly mild summer, many other places had to deal with the heat. Climate dynamics is very complex and there are a lot of variables that go into regional and global patterns and warming trends. To read more about 2014 you can visit NASA's website or NOAA's. Today marks the point of half way through meteorlogical winter! Its starts December first and lasts through February. With temperatures reaching the mid 30s for some of us today, and plently of sun, it even felt a little like spring. Good news is temepratures will be even warmer on Satuday afternoon. A warm front will move in from the southwest late Friday and into early Saturday. Temperatures will warm into the mid and upper 30s, with some hitting the 40 degree mark. Unfortunately, the warmth doesn't last long. A cold front swings through Saturday evening and that will drop temperatures into the lower 30s for Sunday, and it will also bring a slight chance of snow. But comparing this winter to last winter through this time, we've had more warm days this winter. We haven't seen any negative high temperatures yet, like we did last year. We also haven't spent as many days in the 20's, and saw more 30's this winter. Looking ahead to the one and three month outlook, we currenly have a 50/50 shot of seeing either above or below temperatures. Starting below, but ending above. Temperatures will continue to rise above average into the start of the weekend where highs Saturday will reach the upper 30's in northern Illinois, but in the 40's just a little further downstate! 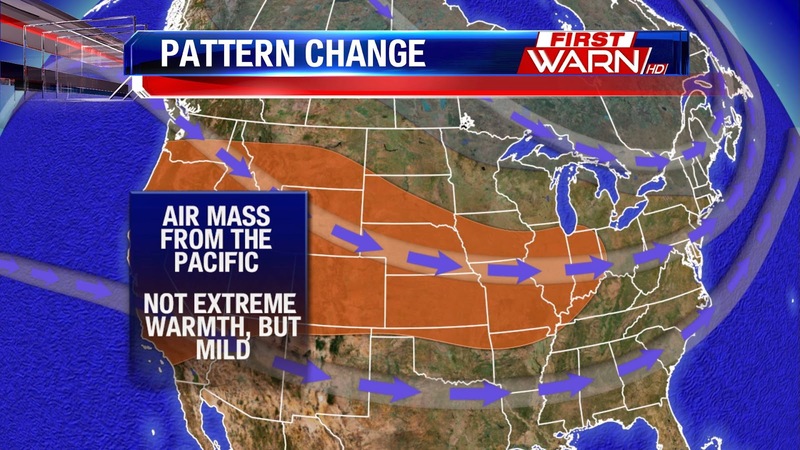 Mild air will flow from the Pacific Ocean as jet stream winds shift more from the northwest to the west. This shuts off the cold air flow from the Arctic as the polar jet retreats back north. The warmer pattern doesn't stick around, however, as it looks like we'll be back with the cold as early as next week. But for now, just enjoy the rising temperatures. Freezing fog overnight Tuesday led to a wintry scene across the Stateline Wednesday morning. The dense fog is done, but it left behind a very frosty landscape. If you have any photos you'd like to share, please email them to weather@wtvo.com. Frost Quakes In The Stateline?